In market making models derived originally from Avellaneda-Stoikov, there is a function lambda that represents the arrival rate of orders. In its prodigy, there are different representations of lambda, some linear, exponential, etc. But, all of these are functions of the difference between the maker's quote and the reference price. How do you calibrate it on initialization? 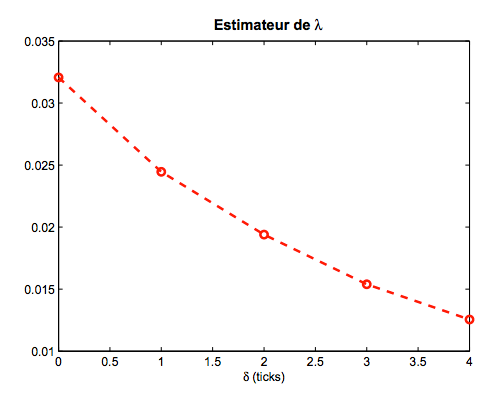 Also, in a Gueant-Lehalle-Tapia model, how are A and K practically calibrated? 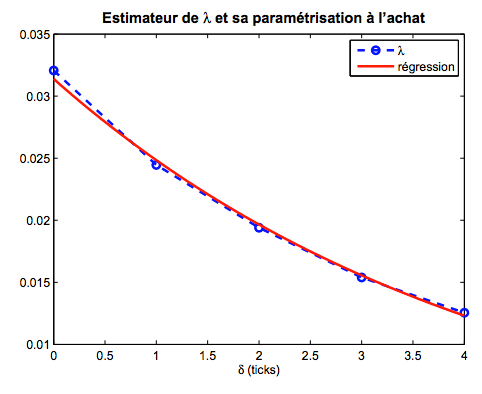 For the paper you refer to (Guéant-L-Tapia), there is a report (in French) by Sophie Laruelle about how to do it in practice: Faisabilité de l’apprentissage des paramètres d’un algorithme de trading sur des données réelles, this title translates into "Feasibility of learning parameters of automated trading systems on real data". Fortunately they are a lot of formulas and charts in her report, so you should be able to understand what she does. check the time $\delta T$ when the price reach $P^m(t_0)-\delta P$ (you have to do the same for $P^m(t_0)+\delta P$ too, but here I will describe it for a buy order). what does "the price reach a given level" means: first trade at this price, or first hit at the next price level? you can take your position in the queue to be in between. Not the answer you're looking for? Browse other questions tagged finance market-microstructure limit-order-book or ask your own question. Market making with resting orders?